Recently I mentioned WholeSoy yogurt, just a couple days before the company had a number of products recalled because they may have contained dairy. I have more contempt for the dairy industry than I do for the beef industy, which makes me shudder every time I see a soy product marketed as “Vegan” that is owned by the dairy industry or manufactured alongside a dairy industry product. Wildwood Soyogurt is NOT produced on equipment shared with dairy. We own and operate our own non-dairy facility. We are the only brand of Soy Yogurt that is not manufactured using shared dairy equipment. The company itself is fairly interesting. It’s a joint company (Pulmuone and Wildwood) with roots stemming both from a family farm in Iowa and a farming cooperative in Korea. The cooperative in Korea (Pulmuone) was started in 1955, and entered the US in 1991. Since 1978, Wildwood has been creating organic/natural vegetarian products – apparently their fame started with the BRT sandwich (Brown Rice & Tofu). Their soybeans mostly come from the midwest, though the company is known best on the west coast. The two companies joined in 2004. (Visit Wild Wood’s website and Pulmuone’s website). As you can see, Niko likes the yogurt as well. I’ve been special ordering it weekly from the food co-op, and between Chris, Niko, Nigel, Puck, and myelf it’s pretty easy to go through a case of 12 in a week. Nice to finally have some breakfast foods around the house. We all agree that Vanilla is the best – though Niko is fond of blueberry as well. Believe it or not, both Puck and Nigel are huge kombucha fans. A couple weeks ago when Puck was having some problems with his food, I gave him some kombucha. It’s full of probiotics, and is supposed to support the digestive system. I guess Chris started giving it to the dogs regularly when I was in D.C., and now they actually beg for it. There could be worse things, right? Speaking of Puck and his digestion, I won’t go into the details but we noticed a huge difference – immediately – when we ran out of Nature’s Recipe dog food and started cooking them meals. I picked up some more Nature’s Recipe food when I was in the cities, and he immediately lapsed back into the digestive problems after eating only a small amount. So the dogs are on a home-cooked diet now (following recipes from Vegetarian Dogs), and seem to be in better spirits and health. It’s hard to take a picture of Niko and Puck together because of their difference in color. But if you look from the right angle, it’s a pretty cute picture. Chris bought some Evolution Vegan Cat Food from vegancats.com a couple of weeks ago, and Niko loves it like nothing else. We got two cans (complete nutrition for daily feeding), VegeCat Supplement (for adding to home-cooked meals, also providing complete nutrition for daily feeding), and some yeast for flavoring. Niko’s been eating about a half-and-half diet – Evolution Canned Food/Pet Promise Dry Food or Homemade Meal/Pet Promise Dry Food for the past week or so. She seems to be doing very well, but we have a lot of Pet Promise food left, so we’re waiting to finish that up. After reading Obligate Carnivore by Jed Gillen, we decided to try Niko on a partially vegan diet. Of course, we need to make sure she stays healthy, but the Evolution food and supplements contain the exact same synthesized minerals found in dead-animal cat food. Commercial cat food needs to contain synthetic nutrients, as the rendering/processing gets rid of nutrients found naturally in animal flesh. The thought of feeding our cat other dead cats, dead dogs, roadkill, and parts of animals “unsuitable for human consumption” is quite unbearable. So, it’s either this route or home-cooked meaty meals (something that my kosher kitchen is not ready to be sacrificed to). I’m sure we’ll have a thorough vet visit in the future, but I am hopeful for this new diet. Many cat and dog refugees/sanctuaries feed their rescued cats and dogs strictly vegan diets, mostly because the people who run the sanctuary are vegan. Think I’m nuts? I’ve got two vegan dogs. (Search the Internet for “oldest living dog” – seriously… do it!). Today, a lot of people are moving their cats to vegan diets – here’s an article from a magazine we subscribe to: Clear Your Conscience, Cat Lover (Satya). Still not convinced? 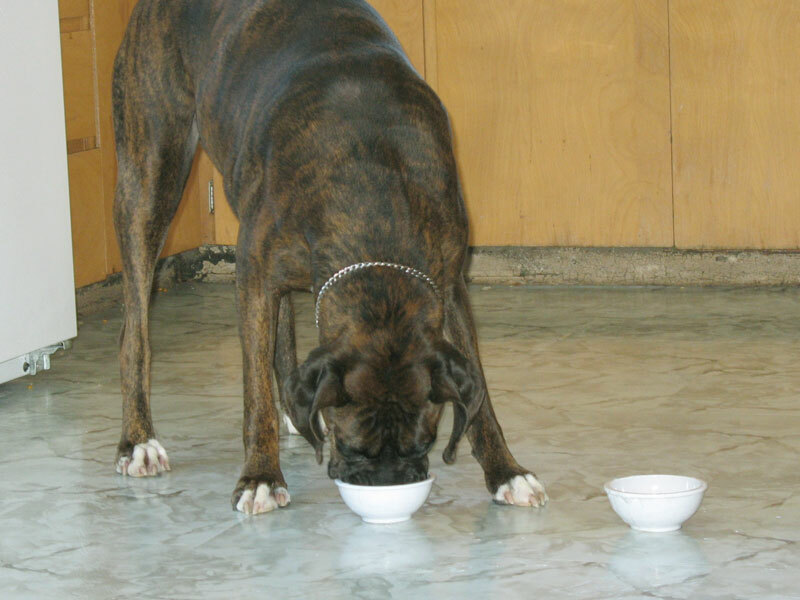 See what you’re feeding your dog or cat (another SATYA article): Whatâ€™s Really in Pet Food? A Report by the Animal Protection Institute … More information avialable from the source, The Animal Protection Institute. … the API does not recommend feeding cats a vegan diet, but their reasoning is because the long-term implications of synthetic nutrients are unknown. A recent study by vegetariancats.com confirms that comparatively, long-term vegetarian feeding of cats does not lead to nutrient deficiency. Many personal testamonials also support vegan cat diets. I received Obligate Carnivore in the mail finally, and have had a chance to read about half of it. Mostly, it’s a lot of stuff I knew before: commercial cat and dog food is gross and contains roadkill, animals “not fit for human consumption”, and euthanized cats and dogs; the essential nutrients in commercial cat and dog food are synthetic and added because they are not found in the parts of the animals that are used to make up the food; vegetarians aren’t doing anything to help their cause by continuing to support factory farming by feeding their animals other animals. Jed Gillen does raise an interesting point: if it’s okay for ten chickens to die under horrible conditions so that your cat could eat happily for a year, would it be okay for ten cats to die under horrible conditions so that your chicken could eat happily for a year? We just ordered a bag of Pet Promise cat food from the co-op (this seems to be the best non-vegan cat food on the market, from an ethical/socially responsible standpoint), and I want Chris to read the book as well. Oh yeah, and I need to finish reading it! If you’re curious, here’s a quick link with a bit of information. When you choose not to consume animal products for ethical and moral reasons, and then choose to have companion animals live in your house and eat the food you buy for them, you have no choice but to question what to feed them. You’ve seen “dog food” and “cat food” your entire life, assuming you live in a developed area of the world where your supermarket has at least a partial aisle of food dedicated to dogs, cats, and other housepets. Take a look at the ingredients you are feeding your animals – no, really, read the ingredients. Most likely, the ingredients start with a “meat by-product,” followed by corn meal, rice/wheat/soy, fat, and artificial flavors. Meat By-Product. I know someone who actually found a beak in a dog treat. No, “meat by-product” does not mean chicken breast, cow liver, turkey leg, or pig thigh – it generally refers to the part of the animal that humans do not consume (eyes, brains, bones, beaks, lungs, ick), and often comes from animals that were “downed” before slaughter, found dead on the side of roads, or were once house pets who have passed on. Yeah, I’ve been thinking about this stuff for a long time. And that’s why I have two healthy, happy, vegan dogs. They’re eating Nature’s Recipe Vegetarian Formula food right now, but I have a bag of Natural Balance Food that I may try and switch them over to (Puck has some allergies that we have yet to determine). So, we just got a cat. Now what? After reading article after article about vegetarian cats, I came to the conculsion that it was the best thing for the cat to feed her meat. Hell, the Vegetarian Society even made it sound like cats should have meat in their diet! The next question became, “If we have to buy meat for our new cat, what company are we going to buy it from?” We went with PetGuard, but now I’m starting to think that Pet Promise may have been the better option, as they favor smaller family farms and more favorable conditions for the animals. I bought the book (not from Amazon, because they told me it would take 6 weeks to ship!) after reading through the online-available pages from Vegan Freak: Being Vegan in a Non-Vegan World, which cites Obligate Carnivore. I’m sure it will be a good read, and will definitely give me something to think about. One caveat: male cats are more likely to develop urinary tract infections than female cats, and the pH of the cat’s food is directly linked to the probability that the cat will develop a urinary tract infection. Male cats switching to a vegan diet should have their urine tested for pH, so their diet can be altered accordingly. For someone who cares as much about their cat as they do about their reasons for being a vegetarian (or vice-versa), I would imagine that this wouldn’t be an issue – pH tests are simple to perform and can be requested at any vetrenarian’s office. It seems that the biggest reason “vegan cats” have been discouraged is simply because people do not take the time to properly take care of their animals. We’ll see. I’ll read the book. Maybe I’ll be enlightened; maybe I’ll continue feeding her what she’s eating now. Either way, I’m not going to throw away the cat food that we’ve already purchased, but maybe even finding a 50/50 balance would be a step in the right direction. After all, a vegetable diet rich in all of the nutrients my cat needs has got to be just as good as the processed diet made from hormone-pumped, antibiotic-fed animals that my cat would never eat had she grown up in the wild (no, cats don’t just wander around killing chickens and cows and fish) – right? Please, please if you consume sentient beings or by-products of sentient beings without their permission, never â€“ I repeat, never â€“ ask this question of someone who chooses not to. What do you eat? Are you sure you’re getting enough protein in your diet? (Are you sure you aren’t getting too much?) Do you know if you are getting the right amount of B12 in your diet? Do you think I have a harder time finding sources of nutrients than a six-ton elephant has? Are edible plant foods very hard to come by? Am I underweight? Overweight? Sickly? Do you know how many years it’s been since I’ve considered putting something that wasn’t grown from the earth in my stomach? Oh, yes – and my dogs are vegans too. And for the past year, I have actually noticed that they are healtier than they used to be. 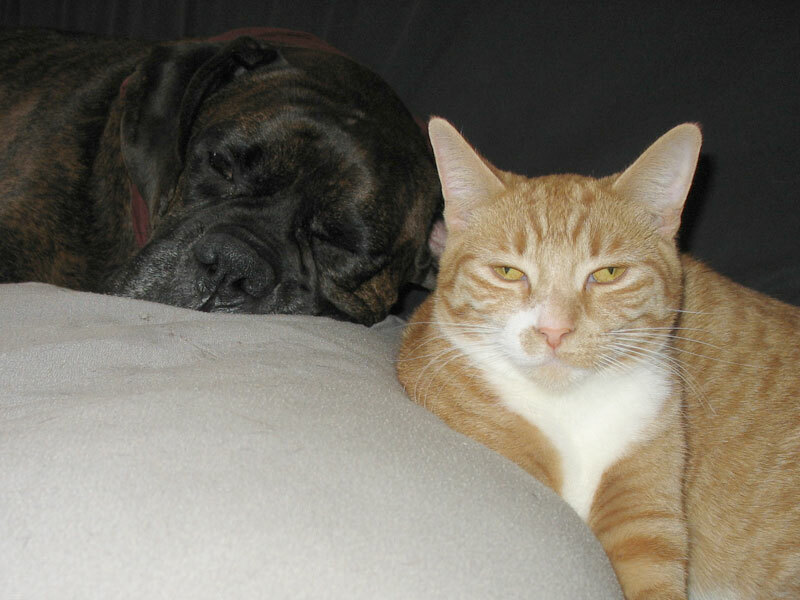 Especially Puck – my special-needs boxer with allergies to things I probably haven’t heard of. Happy, lucky, vegan boys.